One thing I've learned from battling with my skin for years is not to get too product happy too fast. Experience has taught me that switching up my skincare too often and interlacing too many products can stress out my skin rather than doing it much good. 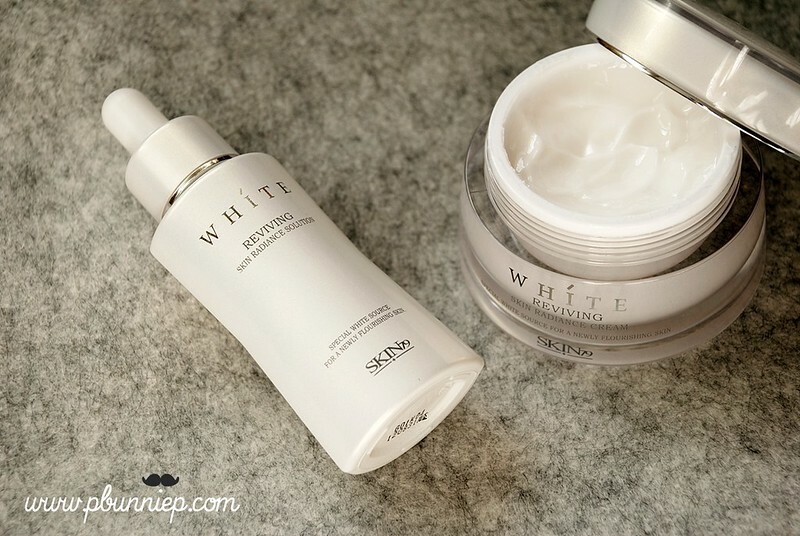 I had been down to my last bits of Hadalabo Shirojyun milky lotion and decided to go back to the Skin79 White Reviving range which I had reviewed and quite enjoyed. This time I kicked things up with the corresponding serum or "solution" which is an intensive clarifying and brightening complex meant to enhance the effects of the skincare set (I'm not a big believer in using an entire brand set but I do think serums and moisturizers should go together). Currently this is my day and night regime for treatments and moisturization, along with my Hadalabo toner ( and occasionally adding the Tony Moly Appletox in extra dry areas). I'm loving how gentle the whole series is, no strange burning sensations plus it's all paraben free which is always a bonus. While it's not quite as hydrating as the Hadalabo, I think the Skin79 series will transition nicely into the spring season. Hi five Skin79 White Reviving buddies! I have been using the Solution for a few weeks now and absolutely love it, and I have a replacement Cream on its way from p&c right now. I absolutely love the luminous glow that the Solution and the Cream give my skin-- it's not sparkly, but gives a nice illuminating boost under my BB cream.